Angel hair spaghetti ( capelini) with olive oil , garlic and herbs , served with meatball and sauce !! 1. 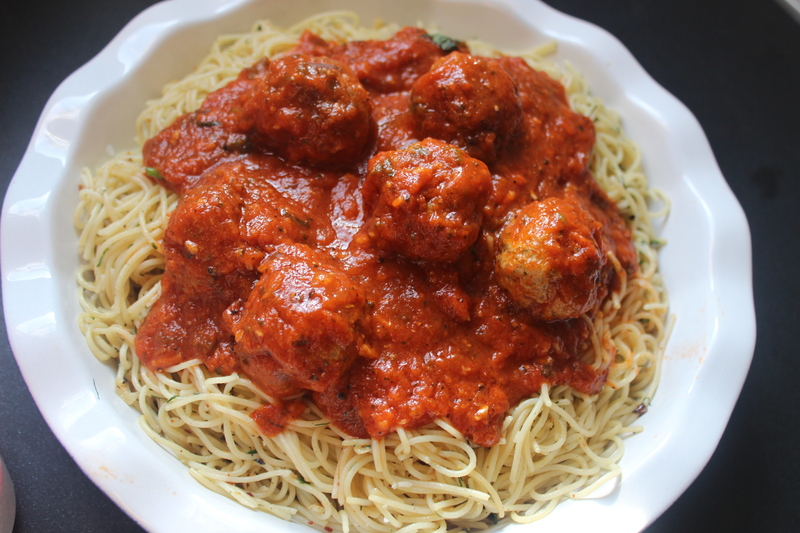 Combine all the ingredients for meat ball . Make balls and shallow fry until lightly brown crusted . 2. For sauce , heat olive oil , add the onion fry until transluscent . Now add the garlic fry little more until onion and garlic are lightly brown . Add the tomato paste and chicken stock . Add the black pepper , salt , sugar , oregano powder and Italian seasoning . Cook until slightly thickens , add the meat balls and cook until thickens to the desired consistency . 3. Boil the spaghetti in salted water as per packet instruction . Drain the spaghetti . Reserve 1/4 th cup water while draining. Heat olive oil and add the minced garlic . Fry until brown and fragrant . Don’t over brown that would make the spaghetti taste bitter . Add the red chili flakes and reserved 1/4 th cup of water . Add the chopped herbs and spaghetti . Sprinkle salt and toss well . Just before serving add the grated parmesan cheese . This entry was posted in Glossary / Notes and tagged Spaghetti, Spaghetti with herbs, Spaghetti with meatballs. Bookmark the permalink.